The LA100 comprises the LA101 Audio Oscillator and the LA102 Audio Measuring Set, which can be supplied separately or together in a single 19" rack mount case (referred to as the LA100R). The units have rechargeable Lithium Ion batteries which trickle-charge when mains power is connected, making them as portable as a multi-meter - ideal for both field and bench applications. 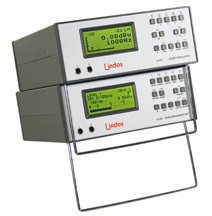 The LA100 can be used for manual or automatic testing, with the results displayed in numerical and graphical form on the back-lit LCD, or uploaded to a computer using the software support package Lin4win (included with the LA100). Lin4Win provides the ultimate in computer controlled audio analysis, and there is a rich built in instruction set for those who wish to write customised control software. Digital waveform synthesis guarantees quartz-accurate frequencies and stable levels corrected to a few hundredths of a dB by calibration factors embedded in the main software EPROM. This design offers fast level changing, frequency sweeps and glitch-free tone bursts. The up-down buttons control the frequency from 5Hz to 38kHz in third-octave steps and the level from �100dBu to +26dBu in precise 1dB steps. The * key gives fine control, with 32 steps per octave and 100 steps per dB. User programmable presets give instant access to five commonly used frequencies and levels. The LA102 is a precision millivoltmeter with an array of filters and rectifiers which, under microprocessor control, provide most world standards in audio measurement. For ease of use there are five basic measurement functions (level, noise, distortion, etc), and each offers a range of options. For example, tapping the NOISE key will quickly give a reading using the ITU-R 468 weighting filter and rectifier, but pressing the OPTION key produces a menu listing various other noise measurement options (ITU-R 468 unweighted, A weighting, ARM-2K, rumble etc). The displayed bar graph exhibits the correct dynamic characteristics for each standard, so the level options include a true rms, VU and PPM rectifier characteristics with a choice of bandwidths (2Hz-100kHz, 22Hz-22kHz or 400Hz-22kHz). Range changing is automatic with manual override and the bar graph can be zoomed (5:1) when dealing with small signal variations. There are also facilities for setting relative levels and peak hold, and for changing the displayed units (dBu, dBV, W or V). When the LEVEL function is selected, the frequency and phase difference (between channels) is also displayed. Left and right input levels can be displayed on a dual bar graph together with a mean phase and phase jitter display. Distortion is measured at 6 spot frequencies using a novel band-stop plus high pass filter. No nulling or tuning is required. Apply the signal - press 'DIST' - read the result - in less than a second. The design guarantees immunity from errors caused by frequency drift. Crosstalk is measured at the same 6 frequencies, with selective filtering to reduce the contribution from out of band noise. Wow and flutter is measured weighted or unweighted, and various other measurements include quantising distortion, difference frequency intermodulation distortion, rumble and frequency intermodulation distortion. Other features include balanced inputs via PO jacks (front) or XLRs (rear) with switchable 600 Ω loading, channel selection and a speaker and 'scope output that let you monitor the measurement (after the filtering and gain stages). Lindos sequence testing has become the de-facto standard for telecomms, broadcasting and production testing around the world. Its simplicity and speed allows a system to be evaluated using measurements which conform to world standards with no chance of error. Sequence testing can be used to evaluate fully any audio circuit automatically in about a minute. Microphone circuits or P.A. 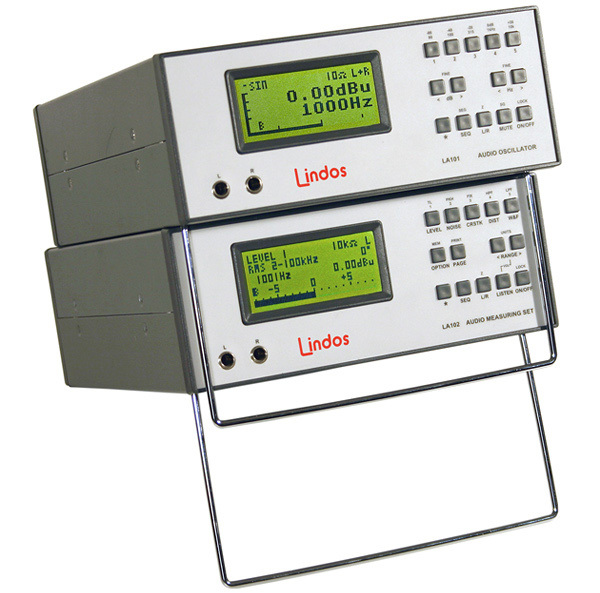 systems; intercoms or intercontinental satellite links - Lindos sequence testing can cope. The test sequence is built from test segments and each test segment consists of the audio test signal preceded by an FSK (frequency shift keyed header). The header acts as a synchronising trigger for the LA102, as well as identifying the segment code and the LA102 responds automatically and makes and stores the necessary measurements. Since the FSK is sent over the audio path, no other communication is necessary between the LA101 and the LA102, so the test sequence may be received automatically at a remote site, or at a different time if the sequence is recorded and played back later. Speed errors on tape replay, which can put other systems out of synchronism, are well tolerated by the LA100 because each segment is retimed from its own FSK header. Over 60 test sequences are built in. Additionally, up to 10 user-defined sequences can be held in non-volatile memory. These are editable either from the LA101 front panel, or on a PC running our Windows software. This flexible approach lets you specify the precise tests and levels to suit the equipment under test. The system is fully backwards compatible, and any LA102 of any vintage will respond to any Lindos sequence. The test results can be displayed on the LCD (including frequency response graphs) or printed directly to a standard printer via the RS232 serial port. User headings can be added and pass/fail tolerances edited and applied, all from the front panel. For routine production line testing, quality control, or acceptance testing, the automatic test sequences allow fast and simple measurements. To make routine testing even easier, the LA102 can compare the test results against tolerance limits and give an immediate "PASS" or "FAIL" display. Measurements which fail the tolerance test are highlighted with an asterisk (*) on both the display and the printout. Ten tolerances are built in to the LA102 and these include British Telecom lines specification (EPS81, EPS84 and EPS98), various lines and studio specifications and an LA100 self test. In addition to these pre-defined tolerances, up to 5 user tolerances can easily be entered from the front panel aided by the LA102's helpful prompts. Lin4Win is a software package providing unrivalled PC support for the LA100 Audio Analyser. Running under all versions of Windows it offers powerful results management tools, sequence & tolerance editors, and easy software and hardware configuration. Close liaison with LA100 users has ensured that this package has all the features necessary to make audio testing even easier. Export of high resolution sweep data to any spreadsheet for in-depth analysis. Developed by Lindos - guaranteed compatible with future LA100 firmware. Lifetime support including free updates as they become available. The 'Control Panel' allows control of the LA100 in manual mode from the PC keyboard. The LA101's output level, frequency and the LA102's measurement options are all only a mouse click away. Quick preset buttons can be setup with any level or frequency. When writing Lin4win's sequence and tolerance editors, our primary aim was to make them easy to use. Although the editors built in to the LA100 are very powerful, they rely on the front panel keypad for all input. With Lin4Win you can type a segment list or tolerance definition and upload it to the LA100. Because you can save definitions the user can have as many as they like. Lin4win offers the ultimate flexibility in results management. Once downloaded from the LA100, results can be displayed, saved to disc, printed or exported to other applications using normal cut and paste techniques. In addition, frequency response plots can be overlaid and analysed on screen. A live cursor continually updates numeric information about each trace. The default print-out format has the popular Lindos format, but this can be customised and user comments added as required. Lin4win was developed in-house. This means that as the firmware of the LA100 evolves, Lin4win will be developed to keep pace, and our policy of providing our users with free updates applies. Technical support is freely available by 'phone, fax or e-mail. The LA100 has no potentiometers, no edge connectors and no ordinary switches - 30 years experience has taught us that they are best avoided. Rugged construction around only two PCBs with quality IDC and IC sockets allows superb access for servicing,- and plastic panels are cheap and easy to replace if damaged.